The European X-Ray Free-Electron Laser (European XFEL) reached an important milestone: the construction of the network of tunnels, which total nearly 5.8 kilometers in length and extend 3.4 kilometres from Hamburg-Bahrenfeld to Schenefeld in Schleswig-Holstein, is now finished. The 11 sectors of the underground facility were completed according to plan. With an investment volume of more than a billion euroincluding 240 million euro for the construction of the tunnels and other underground buildingsthe new international research facility is one of the largest scientific projects on German territory. As of 2015, laser-like X-ray flashes that enable completely new insights into the nanoworld will be generated in these tunnels. The accelerator tunnel is the longest tunnel of the accelerator facility. It runs in a straight line for 2.1 kilometres through Hamburgs underground. The tunnel system eventually branches out into five so-called photon tunnels, which lead into the future experiment hall. Between the accelerator tunnel and the photon tunnels are the so-called undulator tunnels, which contain special magnet structures, or undulators, in which the accelerated and bundled electrons are set on a slalom course. This induces them to emit intense flashes of X-ray radiation. First, the tunnels will be equipped with the necessary infrastructure and safety devices. Then, the main components of the facility will be installed: the superconducting electron-linear accelerator, whose development, installation, and operation will be conducted by DESY, and the photon tunnels, undulator lines, and experiment hall, whose equipment and instrument installation will be led by European XFEL. By the end of 2015, scientists want to produce X-ray radiation for the first time hereeventually, up to 27 000 flashes per second, nearly 10 sextillion (1022) times brighter than the sun. 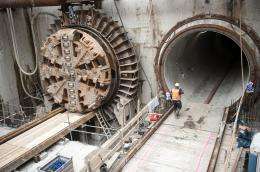 Tunnel construction began in July 2010 with the tunnel boring machine TULA (TUnnel for Laser). In January 2011, the second machine, AMELI (the German acronym for At the end there will be light), started to excavate the five photon tunnels leading into the experiment hall. This was a difficult mission: given the special layout of the tunnel, the 160 tonne colossus had to be repeatedly relocated and made ready for action. With the completion of the last section, the mission of AMELI has come to an end. Tunnelling with TULA was concluded in August of last year. At todays festive event, more than 400 participants celebrated the completion of tunnel construction. Films documented the construction progress and the arrival of the tunnel boring machine AMELI after it finished the last section. But shale gas came just in time to save the american day, it will allow them to pull out of costly resource conflicts in far away countries and keep money and jobs circulating in the own economy... do not underestimate the american spirit, i think they will bounce back again in a decade or two if they come to understand own innovation /production is more important than just buying/controlling worldmarkets with cash or millitary power, in fact they must, because the loans are overdue, and they will.